An 8 inch carrot cake adapted from a recipe in Cooking Light magazine. 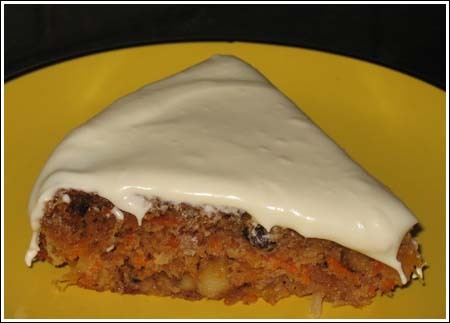 The Cooking Light Carrot Cake can be baked in a metal or glass pan. If using glass, reduce the temperature to 325 and bake until cake springs back when touched. Preheat oven to 350°. Grease an 8 inch square baking pan. If using a glass pan, reduce oven heat to 325. Whisk the flour, baking powder, ground cinnamon, and salt together in a medium bowl. Stir in the 1 cup of grated carrots. Combine granulated sugar, brown sugar, and 3 tablespoons butter in a large bowl. Beat with a mixer at medium speed until combined. Add eggs and vanlila, beating well. Spread batter in the pan and bake at 350° for 28 minutes or until a wooden pick inserted in center comes out clean. Cool cake completely on a wire rack. Make the frosting. Beat the cream cheese and next 4 ingredients until creamy. Gradually add powdered sugar. Spread frosting evenly over top of cake.